In Gascony, where the Montal's Armagnacs come from, time slowly does its work. The vineyards carry the fruit until the moment of distillation and the miracle of the ripening process in the cellars. The Montal's Armagnacs bear the richness of the soil that produces the wines. 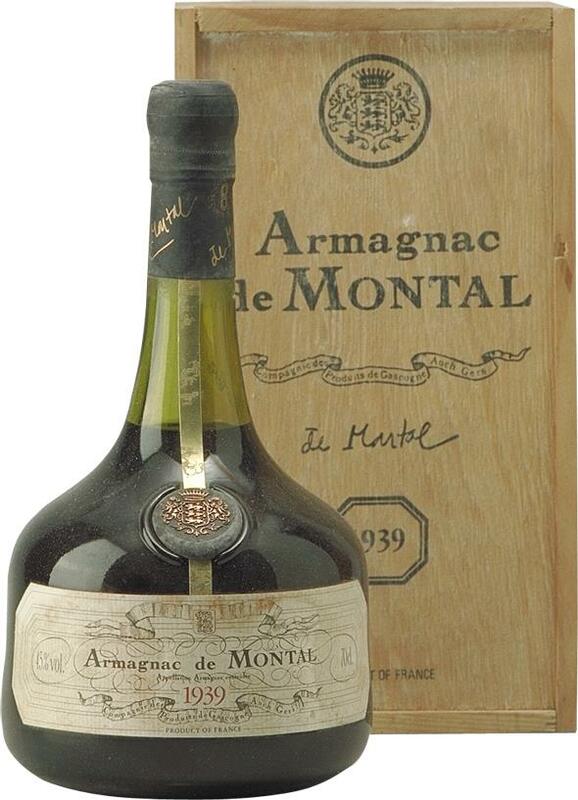 The connoisseur of this world can choose from a prestigious list of the Montal's Armagnac. 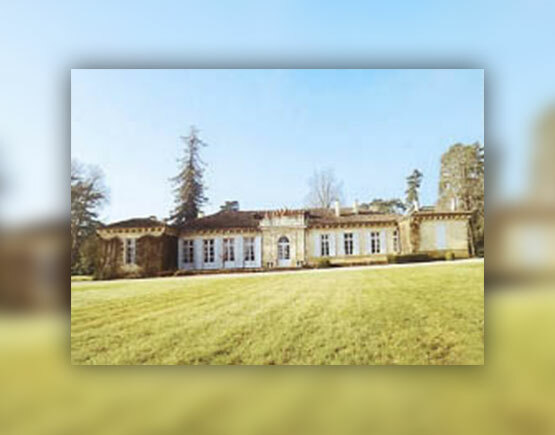 The Bas-Armagnac area, with the best vineyards from the Armagnac region, houses landscapes that are sloping, alternating with sunny vineyards and dense forests that are nicknamed "Black Armagnac" by the gloomy radiance. The soft and moist climate, along with the sunny autumn, creates the subtle flavors and scents. The bottom of the Bas-Armagnac, originating from the confluence of land and sea, consists of rugged sand and gives Bas-Armagnac its character and light aromas. The soil consists of pebbly clay are deficient in lime and give Bas-Armagnac Brandy's its lightness and soft Plum smell. Another characteristic of the area is the pattern of vineyards and forests. Grape varieties: Folle Blanche, Ugni-Blanc and Colombard, are the traditional grapes of the Montal Armagnacs. White wines, which lend themselves by excellence for distillation, are weak in alcohol and free acid, fragrant, delicate and round. They then select the most favorable vineyard. Their method of vinification is entirely natural which means that it is not allowed to add anything artificial. The wine is distilled immediately after the harvest to preserve the maximum aroma. 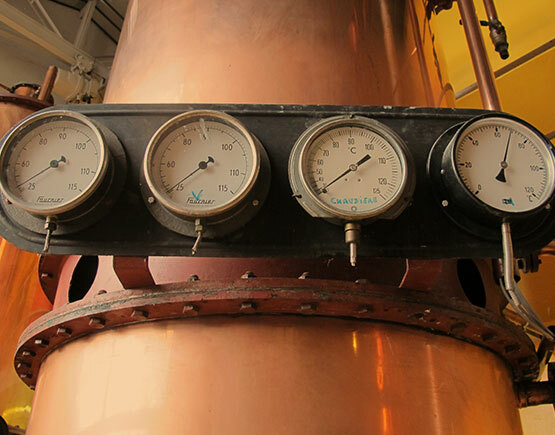 Distillation: Armagnac still possesses a copper boiler to allow the vapors to take off, this under the attentive eye and nose of the master distiller who takes care of the right balance of aromas and fruity scents, as well as the character and style of their Armagnac. 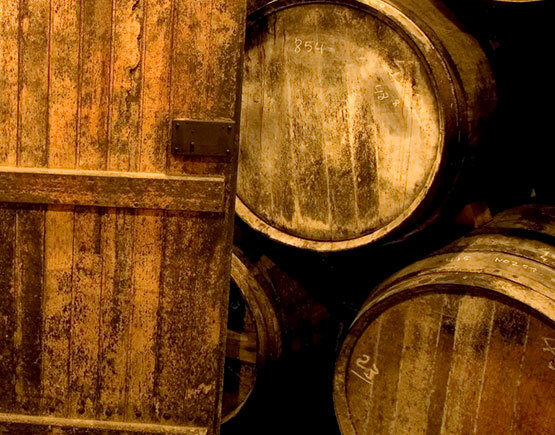 The maturation process the 100-gallon Armagnac oak barrels made from old white oak trees, from the forests of Monlezun and Frêche. This type of oak is best suited for the barrels of outstanding brandy and thus gives its character. 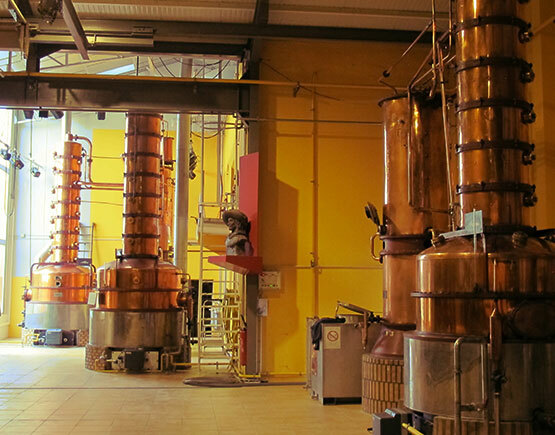 The evaporation of eau-de-vie, also known as "La part des Anges," takes place in the fresh air of their cellars, which ensures a natural reduction process. There is an exchange between the eau-de-vie, the fibers of the oaks and the atmosphere. 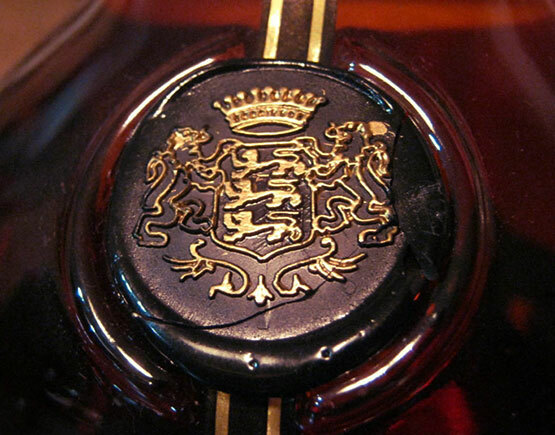 The Château de Rieutort, where the montal Armagnacs are aging, is located in the heart of Gascony. Olivier de Montal, a true musketeer, personally selects the barrels that are “married” for bottling. The Montal harvest in the Bas Armagnac, the "Premier Cru" of the Armagnac region. The Folle Blanche, Ugni Blanc, Bacco (the Bacco grape ensures the pleasant plum aroma) and Colombard grapes. 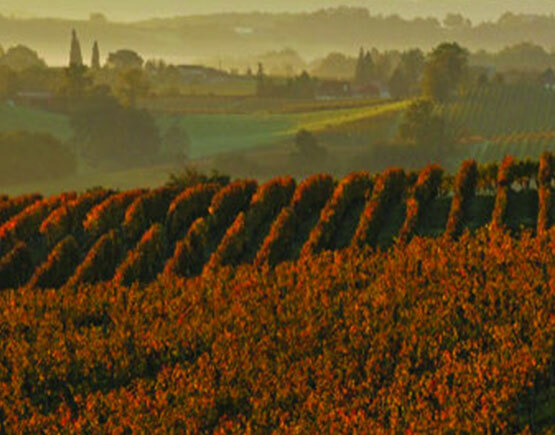 This region carries the best Armagnac, and the grape varieties are known for the high acidity and low alcohol production that cares for the intensity. Olivier de Montal knows by the transfer of knowledge from generation to generation the right moment to choose which is the right moment to be distilled. This knowledge, the climate, the soil conditions of the Bas-Armagnac: pebbly clay and deficient in lime, creates the subtle taste and scent that characterizes this Armagnac. 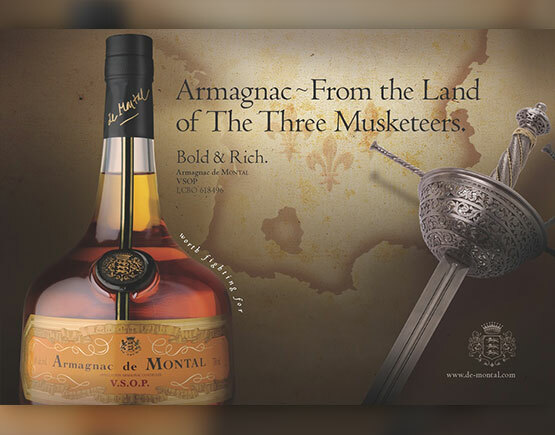 Distillation takes place in three different Armagnac stills; "Athos," "Porthos" and "Aramis" named after the Three Musketeers. 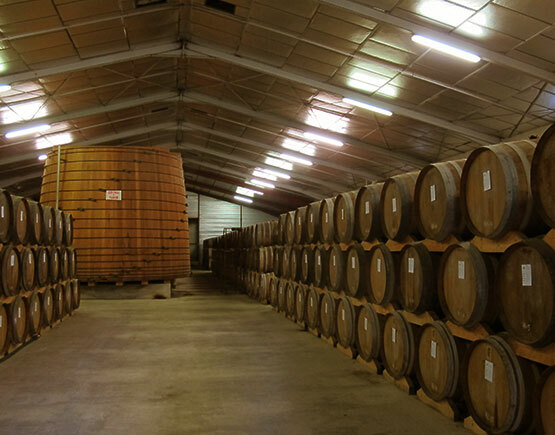 The aging takes place in white oak barrels of 400 liters. 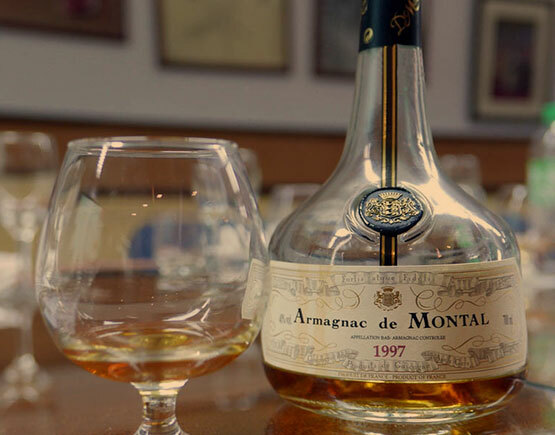 The longer than usual aging gives the Armagnac of the Montal its golden color and the smell of vanilla, lilacs and above all plums.